Works in this exhibition trace artistic legacy – from family member to family member, from teacher to student, from the 1st generation of an art movement to the 2nd generation, and from a specific culture (Native American, for example) to the culture at large. 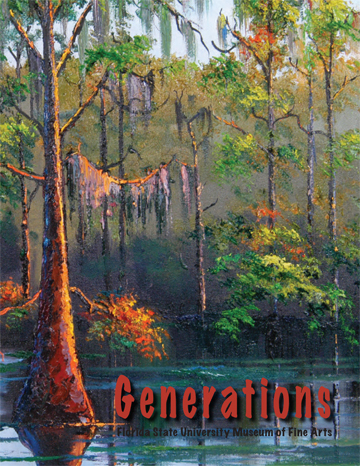 Generations includes international artists like Maya Lin (creator of the Vietnam Memorial in Washington, DC) and her ceramicist father, Henry Lin, or Prefete Duffaut (a top Haitian aritst who died earlier this year) and his son Jean Charles, to regional artists like second generation Highwayman, Aletha Butler, the recipient of the techniques of the first generation of Highwaymen, painters like James Gibson. The exhibition includes works by 41 artists. This exhibition utilized a unique curatorial process. Teachers from 14 schools came together with the curator of education from the FSU Museum of Fine Arts to organize the show itself and its various educational components. Joining the curatorial team were representatives from other Tallahassee organizations: Council on Culture and Arts (COCA), Holocaust Education Resource Council (HERC), Mission San Luis, and the Tallahassee Community College Gallery. Haitian artist, Jean Charles Duffaut, will speak at the FSU MoFA on Thursday, May 16 from 7:00 to 8:00 pm. Children’s art, based on the work by the Generations artists, will be displayed in a parallel exhibition on the downstairs level of the FSU Museum (May 10 to June 7) and at the TCC Gallery (May 20 to July 26). Artists in the exhibition will interact with teachers and students. Mission San Luis will host a hands-on Family Day on Saturday, May 18 (10:00 am to 3:00 pm) featuring Generations techniques and artists, including Haitian artist Jean Charles Duffaut. Preceding the exhibition itself, the Generations Project will offer a teacher workshop on April 8 in which Ela Weissberger, a Holocaust survivor, will speak about the legacy of her art teacher, Friedl Dicker-Brandeis, who surreptitiously taught children at the Terezin concentration camp and died at Auschwitz. Leon County Schools, the FSU Schools, and C-Palms join the other curatorial organizations to help sponsor this event.